waller st skatepark is a hit! we have had nothing but good feedback about the park and we are working to get funding for a permanent park. the rec and park department and the SFSA is actively seeking funding from a variety of sources. Stay tuned! Waller St. is a skateboarding area. It is also a multi-use area. This means on days where there is other events, skateboarding is only allowed on the west 1/3 portion of Waller St. less events are scheduled for Waller in the future. This project is a 6 month trial project lasting in 3 phases. Phase 1: Temporary objects. Phase 2: Rearrange and add objects according to the projects success. 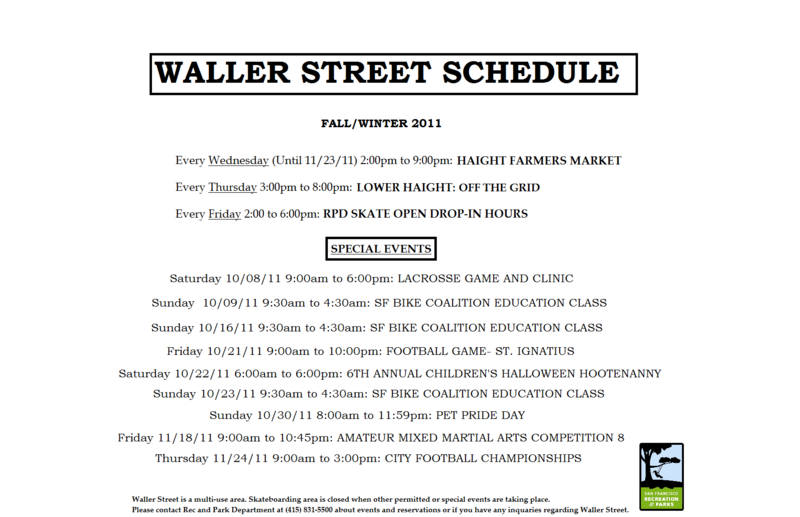 Phase 3: Build a permanent skatepark from the success’s of Waller St. history. the infamous wendy’s benches from markets st circa 1980’s 90’s ) have been installed as part of the pavement to parks program. over the next few months the rec and park – along with the SFSA and various other neighborhood groups will be acessing how the skatepark and various other groups will be able to co-use the space, eventually there will be a jersey barrier and other seating. also remember the flat spot at 6th st is for rollerskaters and needs to be respected. we now have a spot to call our home so let’s make it ours and …. THANK YOU ALL!!!!! especially the young crew holding down the flat spot and not giving in or giving up!! we are working with the park and rec dept. to find funding to begin the design phase of waller st. we are also trying to install temp ramps to bring the public out to this space. We are also trying to find an angel for this park…. any suggestions would be great. polite emails to persuade him to continue to support us, he continued to ignore us. continue to support us and get the contract signed. JUSTIN MADE THIS HAPPEN! Mayor Newsom and Rec and Park director Phil Ginsburg got the contract signed. It’s February now…what’s the latest word there? Such a GREAT location, it’s gotta happen! seems like we are at a turning point for waller st. we have had a successful meeting with ross mirkarimis office and we are going to start a ” pavement to park ” style program where we are incorporating the black marble ledges from market into a mutli use skate plaza. 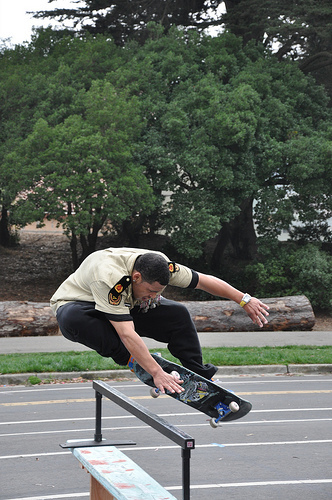 we are working with REBAR group to intergrate some skate-able art and draw the public to that side of the park. we hope to have the go ahead soon … maybe around june 2011.
i hope this is happening. we will be making a skate trip this week and want to stop there… what’s going on? is the park skateable before June 21? park is going to happen. right now there is an air quality assesment being done by the city. we are working on moving them faster. once that is done three months to pick the builder, four months to build. I thought Spectrum was designing the park? What happened with them? Thank you for getting the 6 month pilot program underway! I won’t be in the City for Go Skate Day, but I’m sure it will be fun! another update. we might be seeing some benches soon. lots of details but it will be sooner than later. on another note our presence at the 6th st flat spot has become an issue with the roller skaters who have been inundating the rec park dept with complaints about skateboarders. as you all know vandalism by skaters is not helpful to our cause. even though we have found out that no skater actually vandalized the sign, so if the park puts in a new sign, please dont tear it down. they are getting upset at replacing it. if you want to voice your concern about waller st and the problems at the flat spot. stop by the lodge at stanyan and oak st at the park entrance and ask for phil ginsburg, head of rec park. he welcomes skater input. I hope im right..the picture on the right is Felix…LOVE IT. caltrans/somawest skatepark is getting built! The S.F.S.A. 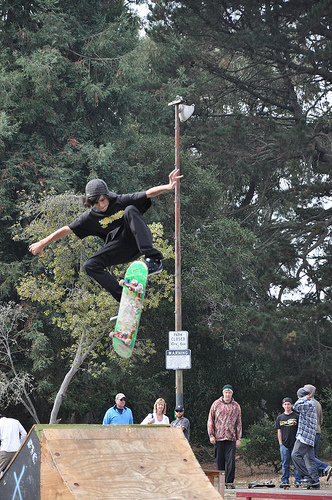 seeks to advocate for skateboarders of San Francisco through organized representation and community action. The S.F.S.A. wants to improve the public’s perception of skateboarders through education, information distribution and community outreach with a focus on the creation of public skateboard parks for the youth of our great city. WE NEED YOUR HELP! Please do your part to help us to realize our dreams. Please browse our website and see what you can do to help.